Teased on the front page of the Village Voice as "Jonathan Lethem's rock 'n' roll novel." I like Lethem. I loved Fortress of Solitude and Motherless Brooklyn. 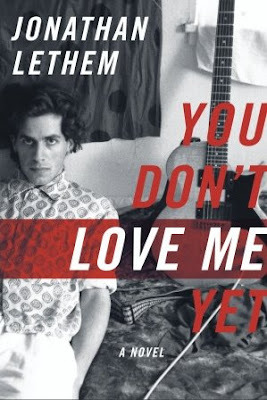 But if Delillo and Pynchon can't pull off rock n roll I'll be surprised if Lethem can. It doesn't look good: the Voice reviewer describes the lyrics to one song as "tough to imagine as a song written by adults, let alone enjoyed by hundreds of fans." Re the design: (1) that's an older picture of Lethem on the cover, isn't it? (2) why all the ital / oblique? I don't hate it, but I always have to wonder when I see it. Does it make the book look like it's moving FASTER?